Today I'm checking out IPA 97 by Bend, Oregon's Silver Moon Brewing. 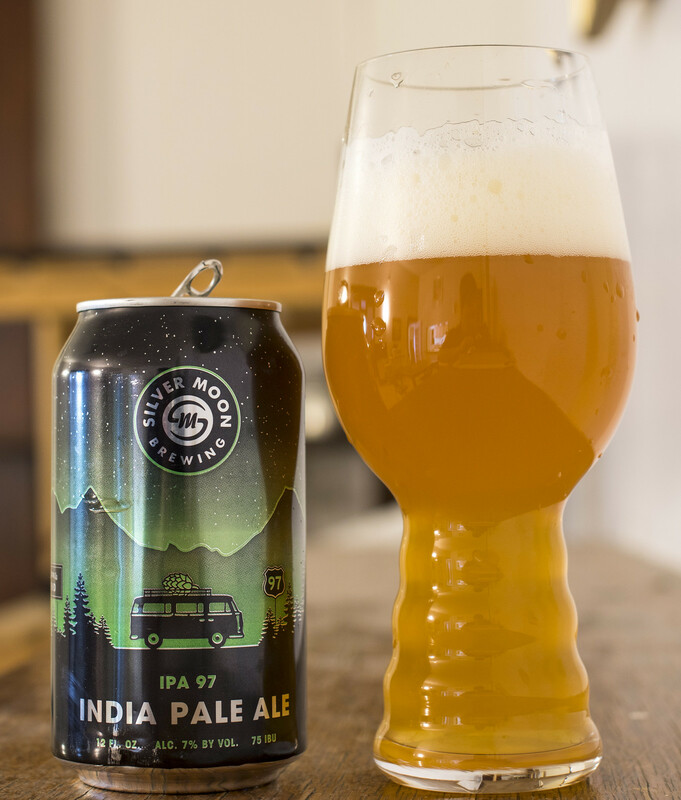 IPA 97 is an India Pale Ale described as a truly Northwest style (IPA), brewed using only the most popular hops in the region. Medium-­bodied, balanced, and deep gold, IPA 97 hits you with bold tropical fruit flavors and a light pine aroma. Sometimes life is about the destination. Just make sure you crack open a great beer when you get there. IPA 97 tops out at 7.0% ABV and 75 IBUs. Appearance: IPA 97 pours a cloudy dark orange body with a light amount of micro-carbonation and a hefty yellowish beige head on top that quickly diminishes to mostly a quarter of a finger's worth of head and a good amount of lacing. Aroma: A bitter yet tropical forward IPA with notes of pine, light floral notes, and citrus notes of lemon, orange peel, pineapple and a bit of a spice presence that my nose can't decipher. Taste: The first impression I got was that the beer was fairly watery to the palate, but as soon as I tried more of the beer it was more substantial. There's a hefty dose of pine, a hint of alfalfa, grapefruit, lemon and a mild dose of pineapple sweetness. Light amount of caramel malt sweetness popping up here and there. Decent Northwest style IPA. Overall Thoughts: This has a good combination of old IPA meets new IPA - it has a great bitter pine presence that I know and love while also blending in a sweet tropical fruitiness in there to give it a bit of a balance to it. This is pretty typical of a good modern age IPA, not overly in your face bitter yet not overly juicy.